News about current projects I'm working on and other items worth mentioning. One of the current projects I'm involved with is been working behind the scenes with the fine folks at Rising Star Studios on their property, ArmorQuest. We’ve been kicking various things around with ArmorQuest for a while and we’re now at a point to start getting this material out there. We've recently launched the website, ArmorQuest.com, and have just released our first digital graphic novel, ArmorQuest: Genesis. ArmorQuest tells the story of a young man named Timothy who finds himself on a quest to join the ranks of the Emperor’s elite force, the Knights of the Way. He sets out with nothing but a sword, a pair of allies, and a hope to one day return home as a hero and save his friends and family from the threat of the dragons. He faces many challenges and dangers on his journey, but through it all, he learns to rely on the tools of the Emperor, the armor of the Knights of the Way. The story begins with ArmorQuest: Genesis – a graphic novel now available for digital download through Amazon and iTunes. 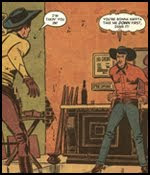 Written by Ben Avery with fantastic art by Sherwin Schwartzrock. ArmorQuest ebook Trailer from Rising Star Studios on Vimeo. The project that has consumed most of my time and creative energies for the past six years has reached completion -- the final volumes of the Z Graphic Novels are now available! It’s been my pleasure to serve as Managing Editor over this line of six 8-volume, manga-sized graphic novels. 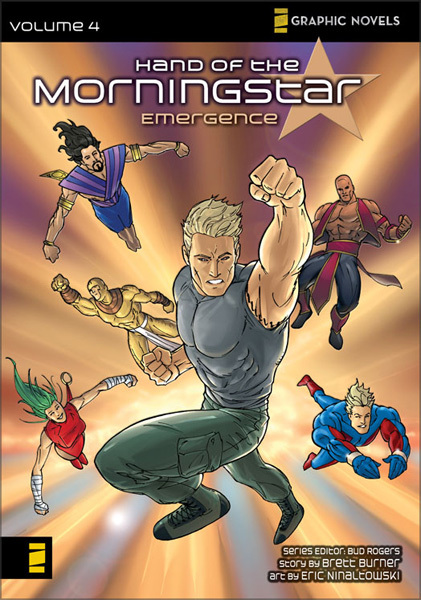 Adding up to over 7,200 pages material, this is most likely the largest amount of faith-based comic material produced in America under one brand. But as impressive as that may sound, what really counts are the stories themselves. Each series in the line has a unique look and voice, and they are all geared to slightly different audiences, yet each one touches on many crucial aspects of the Christian life such as faith, family, forgiveness and redemption. The creative teams poured their hearts into these books and it really shows through. With dynamic characters and pulse-pounding action, Hand of the Morningstar puts a twist to the concept of the typical super-hero story by tackling the nature of hero worship in today’s media-saturated, relativistic culture. A generational saga that traces one family’s account through Israel’s exile into Babylon and their return home. 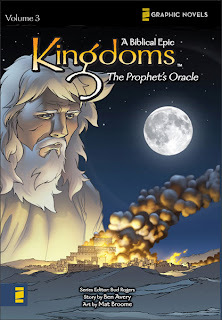 Kingdoms draws upon the rich history of Israel and masterfully places many of the leaders and prophets from the Old Testament in historical context. 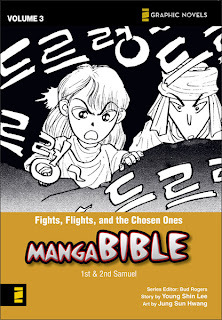 Adapted from the Korean Manhwa series. A little silly at times, but always reverent, The Manga Bible presents the Bible, from Genesis to Revelation, in an engaging format for young readers. Son of Samson takes a look at one of the most famous Judges of Israel as this fictional “son” of his struggles to grasp with the seeming inconsistencies in Samson’s life. Son of Samson features lively action and art that draws the reader into ancient Israel. Exploring the nature of self-identity and family, TimeFlyz is a high-energy adventure as the TimeFlyz and their human friend, Laurel, try to put a stop to who – or what – is kidnapping history’s leading scientists. 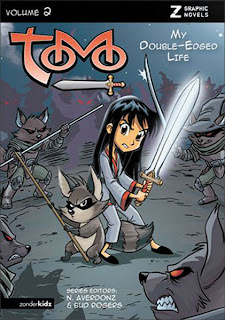 Putting new found faith to the test, Tomo presents the story of a young girl and her destiny to bring restoration to a kingdom crippled by deception. With fun characters and a fantastic setting, Tomo appeals to readers of all ages. These books are available at your more discerning bookstores and online retailers, as well as through my Amazon Store: Bud's Bookshelf. 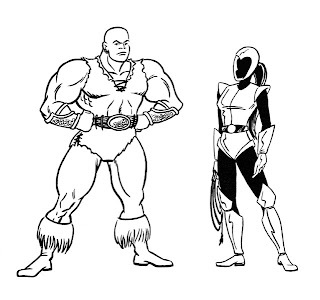 Im glad to see that Ben Avery has just placed ArmorQuest online over at WebComics.CC. 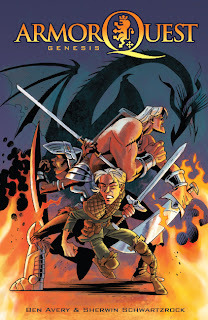 ArmorQuest is a fantasy story about a boy named Timothy who decides he wants to join the Knights of the Way to fight off the dragons that threaten the land. WebComics.CC is presenting ArmorQuest in it’s full page glory and in black and white as originally drawn by the incredibly gifted Sherwin Schwartzrock. Ben, Sherwin and I worked on this story over five years ago and it's always been one of my favorites. It's a story of discovery, determination and faith, and it contains a fantastic mixture of high adventure and spiritual teaching. In launching ArmorQuest online, the "Sneak Preivew" Prequel pages are being posted every weekday. Starting with “Chapter 1″, pages will be posted every Monday, Wednesday, and Friday. 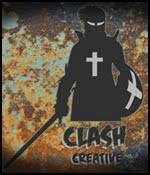 Last week I mentioned Clash Creative and their production/representation of several properties they’ll be submitting to publishers in the near future, but I didn’t know that they had announced a project I had a hand in developing several years ago. 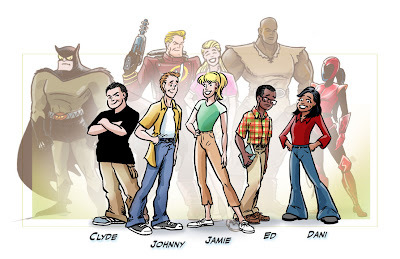 Some time after our work together on HeroTV and before working on ArmorQuest, Ben Avery and I were batting around a couple of different ideas and one of those was this story about a group of kids that were able to turn into real-life versions of their favorite action figures. 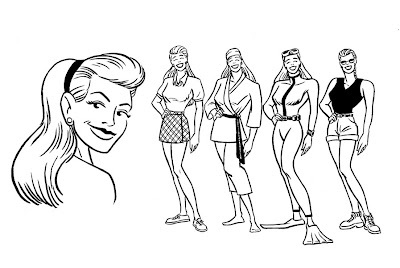 We wanted to hit a wide range of genres with this so we honed in on a 40s-era Cliffhanger Action Hero (Nash Raider), a Silver-Age Superhero (The Cowled Owl), a Sword & Sorcery Barbarian character (Grun-Tar), a Futuristic Techno-Ninja (Red Zero), and a Barbie-type character who was also a Master of Disguises and highly skilled in a wide variety of disciplines (Modelin’ Madeline). With the character types and eras in mind, I set myself to designing the characters while Ben fleshed out the concept and drafted a preliminary script. We had our friend Jonathan Koelsch illustrate a couple of pages of art to get a tidy proposal in place. We moved on to other projects once the preliminary work was completed on the concept, but Ben recently dusted it off and placed it with Clash Creative to give it a fresh set of legs. As a bonus, Clash hired Jonathan Koelsch to complete one of his original pages and to jazz up my designs with colors. 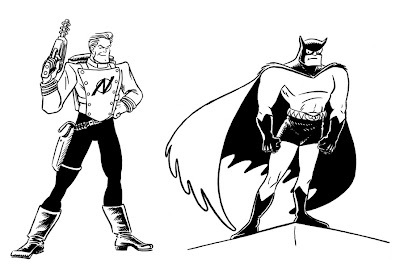 So with Action Figures making it’s debut of sorts, I figured now’s a good time to run these character designs. I’m back to pay attention to my poor little old neglected blog again. It’s been a busy time, but then again, when is it not. My friends at New Creation Now are serializing a comic that’s been quite a while in the making. 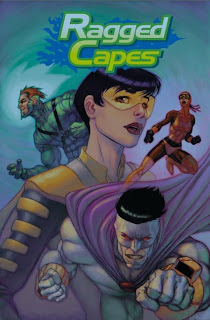 The comic is titled Ragged Capes and it takes a look at the motivations of several super-hero archetypes and how even their most righteous acts can only be considered dirty rags – or in their terms – ragged capes. I was asked to write one of the chapters and so I took the opportunity to flesh out one of the characters I’d been playing around with called Excelsior. I formed Excelsior in the Bruce Wayne/Batman or Tony Stark/Iron Man mold -- that is, a very wealthy, intelligent and powerful man who was driven to go that extra step to help people out (well, to help people out in a super-powered suit, that is). In the process, he’s become my Solomon character, someone who has it all but has drifted away in a spiritual sense. Anyway, that’s my background for the character and I tried to work it in as much as I could within the seven pages I had available. Maybe one of these days I'll be able to devote more attention to him, for now however, this story will have to suffice. This story is titled "Breakdowns" and focuses on an encounter between Excelsior, my symbol of order and propriety, and the anarchist, Rave. 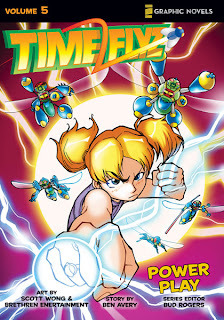 The story was written by yours truly and it was drawn by Bill Maus with colors by Lisa Hutchinson. The first page is up now and new page will become available every week. Gary Martin and Sergio Cariello, the creative team on Son of Samson, were gracious enough to include me (the humble editor) in the creator bios at the end of their books. 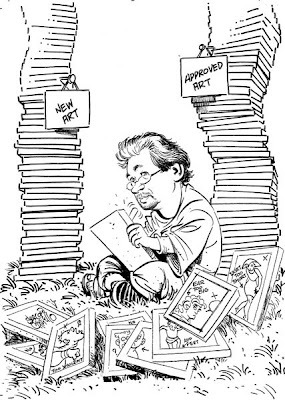 The bonus for this was that Sergio Cariello would be producing a caricature for my presentation. It took me awhile, but I finally got a photo to him and in no time at all, he turned this image around. One of my favorite things about it is the notes included on some of the rejected tablets (yep, my words coming back to haunt me). Anyway, I hope you all get a kick out of this. 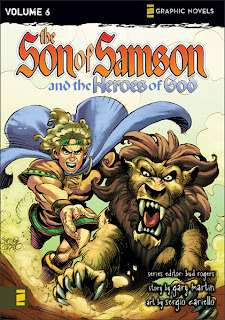 If you haven’t yet, you’ve got to check out the Son of Samson series from Zondervan. It’s a rip-roarin’ action packed series packed with spiritual truth. It’s been quite a while since I last posted here. 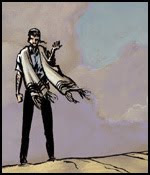 What with overseeing the production of roughly 2,000 pages of graphic novel content this past year, I haven’t had much time for keeping up with other blogs, much less posting here. But with so much going on, I need this centralized place to discuss my upcoming projects and talk about some of the cool things others are doing. WebComics.CC is pretty much everything the name implies web comics from Community Comics (CC). With WebComics.CC we are providing a hub of sorts for some worthwhile, all ages/family friendly comics material. We are presenting some of our existing material such as HeroTV, ArmorQuest and Chosen Mortals, along with some newly created properties such as Music of the Spheres. 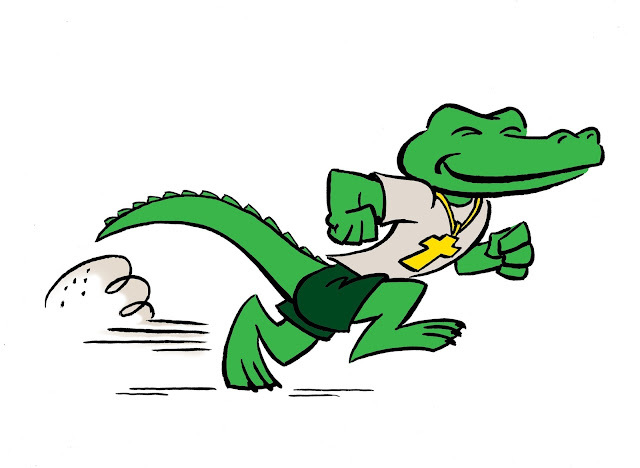 We are also partnering with other web comics that share our sensibilities. WebComics.CC went live late in 2008 and it’s taken a while to build up pages, but by now we have new content going up almost every weekday. So come on over and check it out. With the variety we have, I’m sure you’ll find something to follow along with. The comic that really got me going on this stuff is now online for free over at WOWIO. I had been working on various things for a good ten years prior to HeroTV, but this was my first time wearing the editor’s hat and managing two writers and ten different artists under the framework of a single story clicked for me. 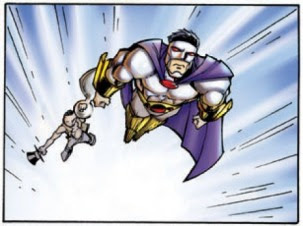 This was also the project that gelled things between me, Ben Avery and Sherwin Schwartzrock and led to the formalization of Community Comics as an actual business entity. HeroTV is a superhero satire/adventure that examines the concept of a hero in today’s media-crazed culture. Is it by might? Is it by power? What makes a hero? In HeroTV: CAPES we travel alongside a team of reality-show camera operators as they document the day-to-day activities of Metro City’s superheroes. But events of the day take an interesting, and quite telling, turn when Professor Graviton arrives and holds the entire city hostage. HeroTV: CAPES features the creative talents of Ben Avery, Darren Brady, Sherwin Schwartzrock, Bud Rogers, Jeremy Zehr, Kneon Transitt, Jesse Hamm, Brian Proctor, Bill Webb, Joey Endres, Eric Jansen, Don Kelly and Jonathan Koelsch. I'm a cartoonist, an illustrator, and an editor of comic books/graphic novels. I'm married to an absolute doll and I have two daughters who have given me a nice head of gray hair. I watch way too much TV and I enjoy my Sunday naps.